Transportation The Randen (Keifuku) line to Omuro Ninnaji Station and 3-min. walk, the City Bus to Omuro Ninnaji and 1-min. walk, the JR Sagano Line to Hanasono Station and 15-min. walk. The 59th Emperor of Japan, Emperor Uda, abdicated early in the Heian Era. 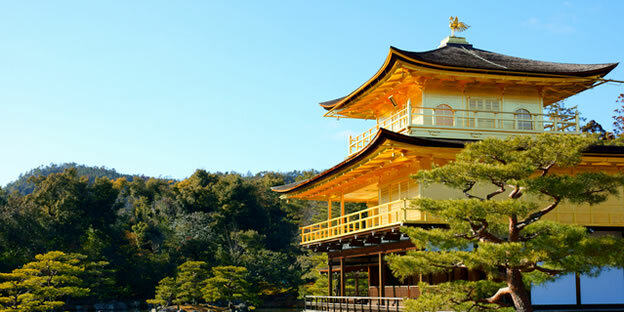 He then took the monk’s vows, founded the Ninnaji Temple in 888 AD, and retired there as its head priest. In this capacity, he constructed a residence known as Omuro. 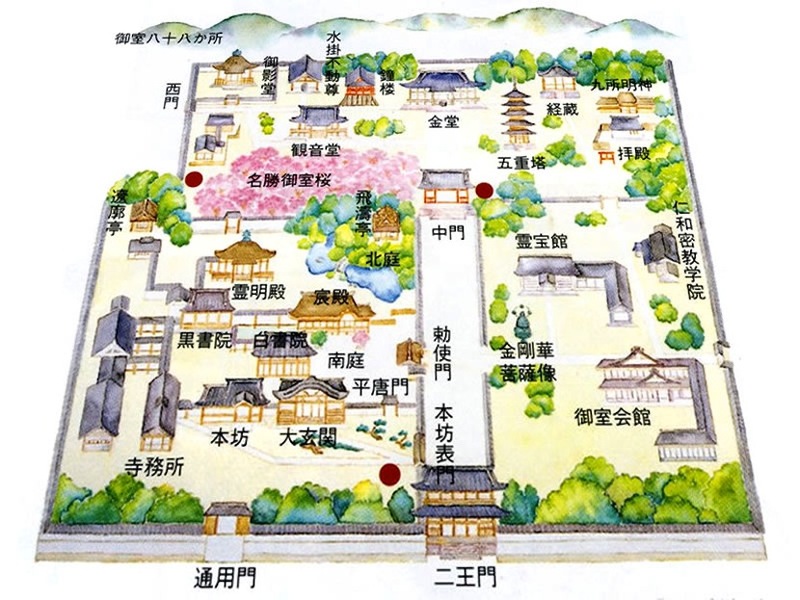 Because its palatial design was reminiscent of the imperial household at Gosho, the living compound eventually came to be known as Omuro Gosho, or the Omuro Imperial Palace. Thus, the historical bonds between the temple and the imperial family run deep. From the days of the Omuro Gosho until the modern era, the abbot at Ninnaji was traditionally one of the Imperial family, an arrangement that served to unite the various Buddhist denominations and schools in Japan. Most of the buildings at the temple site were destroyed in the Onin War, a devastating civil war that divided Kyoto into two parts. 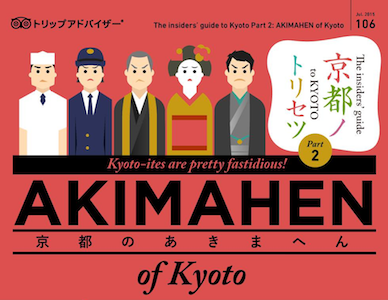 However, Ninnaji was fully rebuilt early in the Edo Era, about 150 years later. 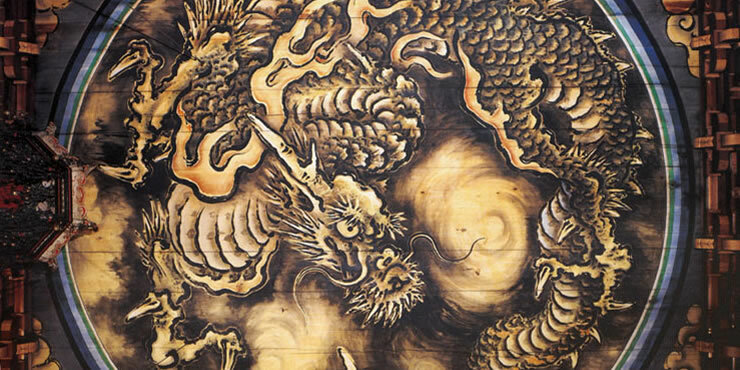 In the restoration, the Kondo (Main Hall) – one of Japan’s national treasures – was relocated to Ninnaji from the Kyoto Imperial Palace, further lending the palatial influence that continues to define the temple architecture today. The entrance to Ninnaji is the imposing Nio-mon Gate, guarded by the two otherworldly, wrestler-like Kongo-rikishi statues who fix a chilling, angry stare at all who pass. Nio-mon, along with the Sanmon Gate at Chion-in Temple and the Sanmon Gate at Nanzen-ji Temple, is one of the three most famous of the numerous temple entrance gates in Kyoto. 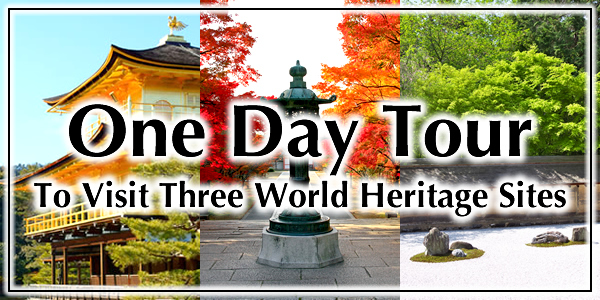 Admission to the temple grounds is free, and there is also no charge for viewing most of the buildings. However, there is a fee for touring the Goten Complex (monks’ residence halls), which is a highly recommended highlight of a visit to Ninnaji. The graceful architecture of the Goten buildings, and the stately gardens surrounding them, create an atmosphere that seems to transport the visitor to the Imperial Palace in an era lost to time. 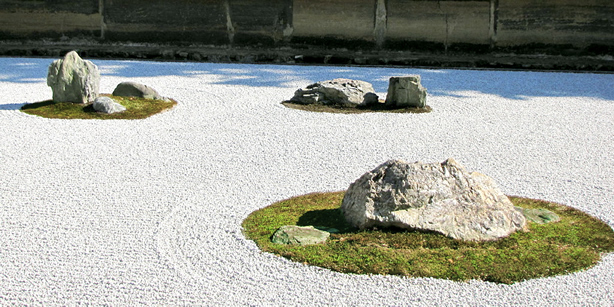 The South Garden, patterned after the garden used for ceremonies at the Kyoto Imperial Palace (Gosho), is covered with white gravel sand. Meanwhile, the North Garden is more elaborately arranged. It features a pond and miniature mountains brought together with other elements to suggest a landscape painting in three dimensions. The temple’s famed five-story pagoda rises in the distance behind the North Garden scene. Together, the gardens that ensconce the buildings not only block out the physical world, but seem to prevent time itself from ever reaching or affecting the Goten Complex. 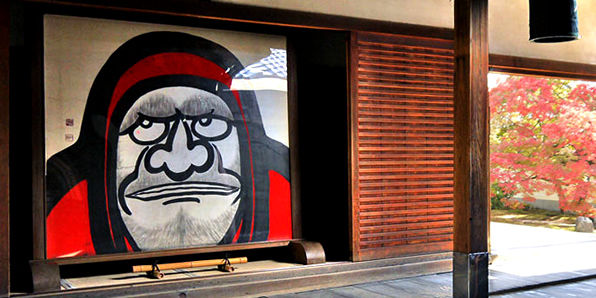 In addition to traditional architecture, Ninnaji is also a celebration of the seasonality of Kyoto. 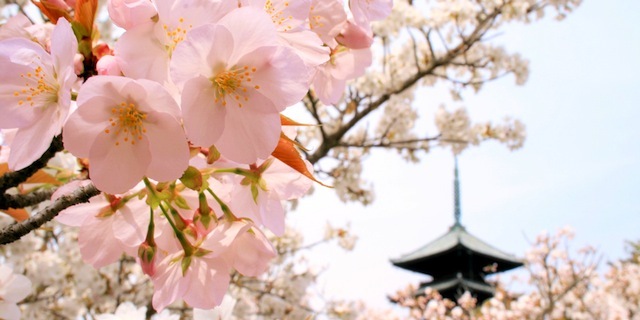 The temple is a famous site for cherry blossom viewing during the spring, not least because it is the last location to bloom in the city of Kyoto. The blossoms at Ninnaji mark the end of the viewing season in mid- to late April. 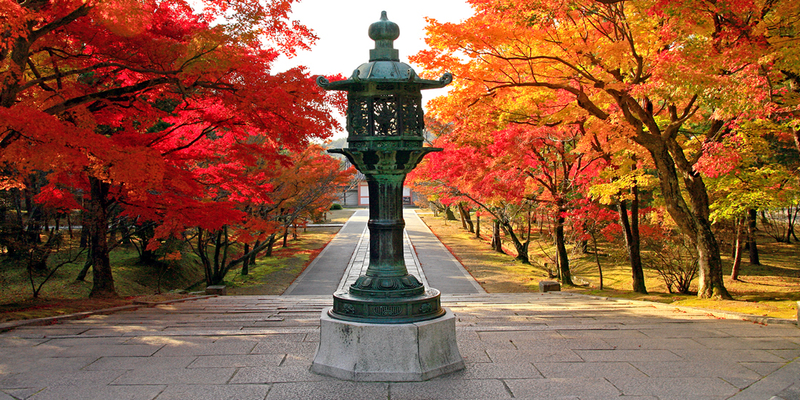 Then the temple is thronged once again when autumn arrives, bringing with it the red and yellow maples leaves that represent the beauty of the fall. 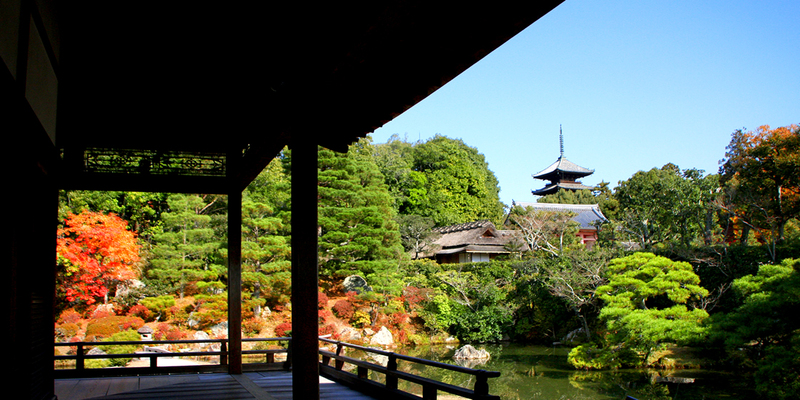 Ninnaji was recognized by UNESCO as a World (Cultural) Heritage site in 1994.